Is AI paving the way for an improved Indian health sector? 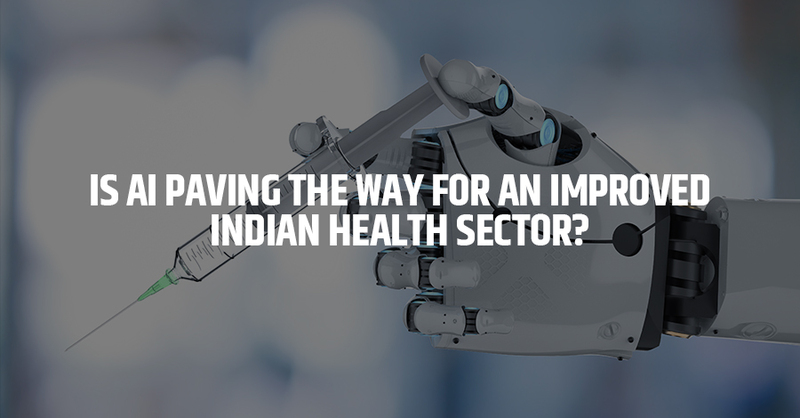 Home/Uncategorized/Is AI paving the way for an improved Indian health sector? Taking a walk down the lanes of medical history, we realise how far we have come in terms of development in the healthcare sector. Where 4000 years ago Sushruta, the first surgeon of the ancient world, conducted surgeries using the art of Ayurveda, today we find the influx of artificial intelligence further enhancing this field. When it comes to the question of saving lives, the infinite possibilities that AI opens up to improve medical outcomes cannot be ignored. With about 70% of deaths occurring due to medical negligence in India, the need to integrate AI within the healthcare sector seems all the more crucial. Understanding the benefits of early adoption of AI within various domains, the Indian landscape seems welcoming towards new-age AI technologies. According to a report published by CIS India earlier this year, out of the US$5.5 Billion that was raised by global digital healthcare companies during the third financial quarter, at least 16 Indian Healthcare IT companies received funding from international investors to bring a paradigm shift to the Indian healthcare system. In the year 2017, over 5.2 Million deaths were caused in India due to human medical negligence and errors alone! Another major problem plaguing the Indian healthcare sector is the employment gap. According to the Indian Journal of Public Health (2017 edition), India has 4.8 practicing doctors per 10,000 people and by the year 2030, the number is expected to grow to almost 6.9 per 10,000 people. However, as recommended by the World Health Organisation (WHO), the recommended minimum doctor to patient ratio is 1:1000. In addition, India also faces an underdeveloped drug development and research sector. Since the process of drug discovery is indeed both expensive and cumbersome, healthcare industries usually take years before a functional drug is discovered. Thus, the large scale debut of AI in this field will not only ease out the mounting number of causalities due to mortal errors, but will also make the rate of drug discovery both rapid and more effective. Where is the future of AI in this sector? Diagnosis: In addition to big names such as Google Deep Mind and IBM Watson, India is also home to a number of startups that are making use of AI for medical diagnosis. For example, the Indian startup Qure.ai uses deep learning and ML technologies to help diagnose an array of diseases and further recommends personalised treatment plans for its users. Furthermore, hospitals in India are using IBM Watson for recognising cancer cells in their patients’ bodies at an early stage. Precision in surgeries- Performing surgeries can be a complex task with a lot of room for errors. However, new technologies and devices are giving way to faster and more precise methods of conducting surgeries. The Da Vinci Surgical System for example is specifically designed to conduct minimally invasive surgeries that require greater precision, where in the doctor conducts the surgery with the help of an external console. Drug discovery- Even after spending Billions of dollars and years of research for discovering a new drug, there is no surety that a functional drug will be produced. But companies like Atomwise are making use of AI technologies to find pure antidotes to some of the world’s most infectious and fatal diseases such as Ebola. The company also offers 50 molecular discovery programmes that work and rework on their own to combine and form useful drugs. Health Monitoring- This is one area where AI has also made a strong foothold in the commercial space. Wearable health devices such as Fitbit, Apple smart watches and Garmin among others are used to track heart rate and other medical symptoms. These devices are further being updated to send alerts to the saved contacts in case it measures a medical abnormality. The Indian government has taken a series of initiatives to smoothen the process of implementing AI within the domains of healthcare, which includes the setting up of an ‘Artificial Intelligence Task Force’ by the Ministry of Commerce and Industry. The State governments are also providing support to AI startups. The Karnataka government has planned to mobilise Rs.2,000 crore by 2020 towards supporting the same and also has a Startup Policy and Karnataka Information Technology Venture Capital Fund that can support AI startups. I saw a lot of website but I think this one has got something extra in it. These are in fact enormous ideas in about blogging. You have touched some nice points here. is analyzing such things, thus I am going to inform her. like yours. It is lovely value sufficient for me. 5 Gadgets powered by AI that you never expected to exist. Who owns the content created by an AI? Patent and Copyright privileges. Interview with Roman Yampolskiy, Professor at University of Louisville.